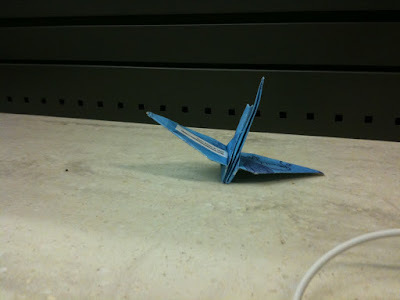 I started trying to work on putting up my crane entries after my leisurely airport dinner but before my boarding time. I thought I had had plenty of time to do so, but evidently not. While I certainly didn't miss my plane, I did cut it a little closer than I should've, that's for sure. Thankfully I've never missed a plane. Have you ever missed a plane? What did you do?
! Were you visiting San Fran or just flying through? Love that city.